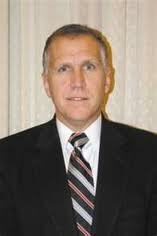 Republican Speaker of the North Carolina House, Thom Tillis. We're calling him "Thunderdome Tillis" for his apparent relish at pitting single mothers against the disabled in a virtual steel-cage match to grapple for the crumbs that his Clown College of Republican law-makers in Raleigh leave the poor -- once they've made life as cushy as possible for corporations. To recap, Tillis made his "let's find a way to divide and conquer people on welfare" statement at Mars Hill College last Friday. Maybe Tillis is embarrassed to be caught exhibiting the human fellow-feeling of Vlad the Impaler. But frankly, we're not sure that he, let alone his Republican co-conspirators in the NC General Assembly, is capable of being embarrassed. You know, I guess I appreciate on some level that Tillis is honest enough to come out and say what he thinks. What's more dangerous are the politicians who feel the way Tillis does but are crafty enough to disguise their antagonism towards the poor and their worship of the wealthy.